"I could have used these glasses over the holidays when I had to chop a lot of onions. 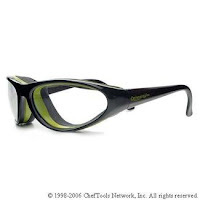 The goggles have a foam seal that shuts out onion smells and protects your eyes. They also have anti-fog lenses and don't look that unattractive." - person who wants to buy ridiculous looking glasses. you need not buy those 3-D vision glasses for the upcoming star trek convention. Another variant of the ever useful kitchen contraption, onion goggles. They come with tiny detachable tea cups, in the rare case that you wish to stop chopping onions and want to sit down for a jolly good cup o' tea with a spot of lemon innit. Well, There's more, but thats all i can remember for now. "just in case you 'accidently' stumbled upon this looking for ideas". I've lost my funny. I haven't thought of/heard a good joke in forever. Contact the 'Make Sabira Have a Happy Life Foundation' on any details regarding the same. Generous gifts (plus the self content of knowing that i'm all peachy, i must add) will follow. Since i'm on the topic of humour, i may as well clear my stand on repitition. I'm all for it. States that a joke can be repeated to different audiences. It promotes good cheer (and a funny reputation for you.) It also allows maximum milage. States that a joke can be repeated to audiences, on the condition that due credit is provided to the original teller. In the special case that I happen to be the original teller, or creator (which is a common case, considering my quick wit) due credit must be given, and a few words/lines/conversations about my brilliance is obligatory. On negligance of clause (b) strict action will be taken, which includes isolation for upto three months,or a written apology or both. On russel peters repeating his jokes: give the poor guy a break! He didn't expect his performances to be taped and put up on the internet. Technically he only tells each audience the same joke once. I've always wondered why the princess does it. Why would any one in their right minds kiss a frog even if it was going to turn into this supposedly completely gorgeous prince? There are so many other fish in the sea (Hehe) after all. It boggles the mind. dining on frog legs. They are a delicacy, and I'm epicurean. But on the bright side, if frogs turned into princes, maybe there is hope in the world. *This poster was strangely appropriate. I didn't make it. I'm sitting in the same old room, near the same old computer, thinking about publishing some new entries before i get back to college and get completely absorbed in that. Its not because i love it, but because i feel compelled to keep myself busy. I am now in possesion of a fringe. I think its a bit too short, but i can live with it. I've had far worse.I'm almost choking with the cigarette smoke hanging around me and i'm going to be rather surprised if i don't develop any type of cancer before i'm fifty. sometimes, i almost regret being so averse to smoking, because if i wasn't then at least i'd be able to enjoy it and kill myself slowly, instead of letting others do the job. its a little unfair, don't you think? I'm surprised at the amount of deviation i've made. I've always thought i was a pretty stable character but that isn't so true. At the end of all of this, i'm going to be so far from right now. I like watching children. Its fascinating to see how they get so curropted. But now, i like it. I've spent the past fifteen days dwelling on the past and the future.. pretty much forgetting the present. Its cliched. But now, I won't. And i am not. I sit there and watch her from across the room. She just seems to command it. She shivers furiously when the wind blows, giving the illusion that its freezing cold when it isnt even close. She smiles. Mysteriously, if i might add. She walks over. No, she glides over.. almost as if she's being blown over by the wind. I get a clearer view of her, lines under her eyes and a few blemishes that i couldn't see from afar.. and another smile. But this time, its far less mysterious. Her magic seems to fade as she approaches, and vanishes entirely when she talks. She rambles on about herself for a minute or two, stopping periodically to ask me things about myself that she probably doesnt give even the littlest inkling about. I answer, nonetheless and smile politely here and there. She tells me things about herself, slightly personal things.. that I, perhaps, would have liked to avoid. She always comes off wonderfully though, in her stories. Like one who possesses incalculable wisdom. admire her, worship her, and aspire to be like her. She laughs. Its one of those perfect laughs. Tinkling and delicate, the kind that you can fall in love with. But thats the surface of it. Theres some conceit in it, if you bother to dig deeper. She dominates me still. Though not like before. Now its forced upon me. I continue to behave appropriately, almost humouring her. I am a little spineless. But then i ask her, i almost cant help it. 'Why are you like this? It seems so unnessecary, so adopted. You're alot less complicated'- i say, for lack of better words. 'so much more...' I repeat, mumbling under my breath. This may not be universal. I don't expect it to be. But you know nothing. Nothing more. They are slimey, underhand and people you think you know. If you don't make mistakes, you don't learn from them. If you make mistakes, you learn from them. If you learn from them, you don't make mistakes. But if you don't make them, you don't learn from them and therefore you make them. -Everything is complicated. Watch out for the loopholes. its not what its cracked up to be. "Oh. Then you can just kick him in the balls"
"No! Why would i do that? I won't do that!" And here I'm almost doing it, and you're standing in the way and blocking me.